Commemorating the 22nd anniversary of Vagabundo’s release – purchase your copy of Draco’s Vagabundo 22 vinyl LP in-store only at Amoeba on Aug 8 to meet Draco, have your photo taken with him, AND receive a pre-signed poster as a gift! – Vagabundo 22 LP will be available for purchase at Amoeba Hollywood on August 8th. Limit 2 LPs per person. 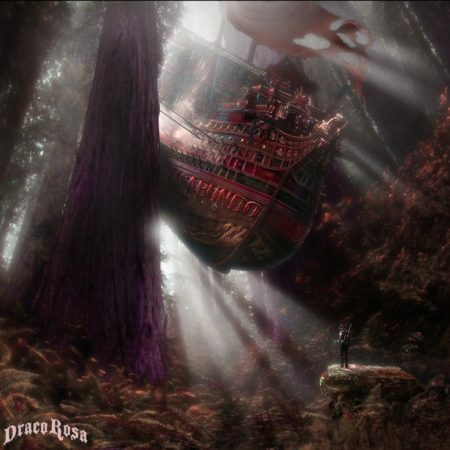 Each LP purchased receives ONE ticket to attend photo/meet and one pre-signed Draco Rosa poster. Space is limited. – Line for Photo/Meet ticket holders will form on 8/8 at 4pm on Ivar side of store. – A professional photographer will be taking photos of each fan with Draco. Photos will be available for retrieval after the event. Instructions for fans to download their picture will be given out at event with album purchase. 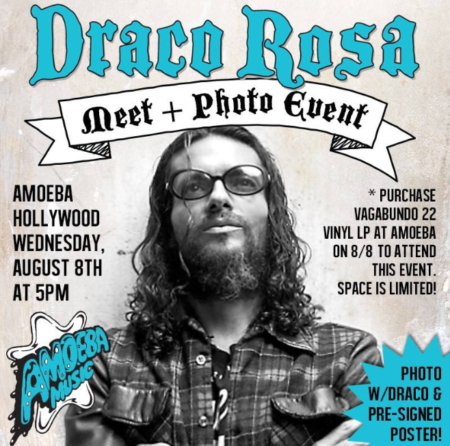 – Draco Rosa will not be signing albums or any other items at this event. With a successful career, Draco Rosa has toured the world, filling prestigious venues while reaching a very solid fan base. Inducted into the Latin Songwriters Hall of Fame in 2016, Rosa was bestowed with the honorary degree in Humanities and Business Administration from the Universidad del Sagrado Corazón (USC) in Puerto Rico.The multiple-time GRAMMY and Latin GRAMMY winning artist has received received many awards and recognitions for his career as a recording artist and also for his accomplishments as a composer, musician, singer, songwriter, producer, entrepreneur, and philanthropist. * Special anniversary, remastered version (22nd anniversary). * Two (2) previously unreleased versions of tracks (Vértigo 22 and Madre Tierra 22). * One of “The 50 Greatest Latin Albums of the Past 50 Years” by Billboard Magazine. * Spin Magazine’s 1997 Top 10 list of “Greatest Rock en Español Records of All Time“. * Original album produced by Phil Manzanera, guitarist for Roxy Music. * Remastered by Bob Ludwig (Led Zeppelin, Queen, Jimi Hendrix, David Bowie, Paul McCartney, U2, Daft Punk, Radio Head).